Home > Book Review > Book Review: Why Not Women? David J. Hamilton is a veteran missionary who has ministered in more than 100 countries. He speaks several modern languages and has studied the original languages of the Bible. 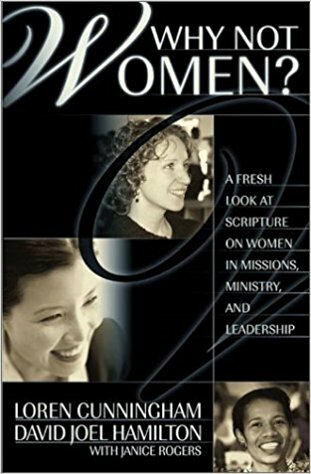 His master’s thesis, done in 1996 for the College of Christian Ministries, and published as I Commend To You Our Sister, serves as a basis for much of the material in Why Not Women? Cunningham shows how biblical gender equality is an issue that goes to the heart of the church. Satan is attacking the church by a tactic of deception that effectively cuts the number of workers available to complete the Great Commission. “Two-thirds of all Bible-believing Christians are women,” he says. “Why would anyone look at the huge harvest we face and the tiny workforce trying to gather it in and seek to eliminate any workers whom God would call?” He also shares examples of how women are devalued, mistreated and discouraged because of this deception. The authors trace our cultural roots to ancient Greece and Rome, revealing the incredible difference between the Greek and Roman beliefs about the origins of life and the biblical record. Greeks said women were the daughters of Pandora (an evil goddess put on earth to curse men), and the Romans said women were the offspring of Venus (a sensual god prostitute) or Juno (the shrewish and scheming goddess of marriage). In contrast, the Bible says God created both man and women to rule the earth. Woman was designed to be an equal partner with man. Before reading this book, I didn’t realize we are still under the influence of Greek and Roman culture to some degree. I thought I understood how women were treated in biblical times, but never truly visualized it. This book made me feel the pain of my ancient sisters. Understanding these cultural influences as well as the way language has changed over time is crucial for gaining insight into the difficult passages of the Bible. Approximately one half of the book is devoted to studying the teaching methods of Paul and the original languages of the Bible. The authors also included several illustrations to clarify concepts within this study. This book represents a call to action for all Christians, male and female, for obedience to our Lord, using whatever gifts he has endowed us, to do whatever he’s calling us to do. Shari Voigt is a freelance writer who specializes in newsletter, press releases, and promotional copy. As a wife, mother, youth leader, and active participant in the local women's ministry, she cares about sharing the message of biblical equality.